We take a look at this year’s cream of the crop. 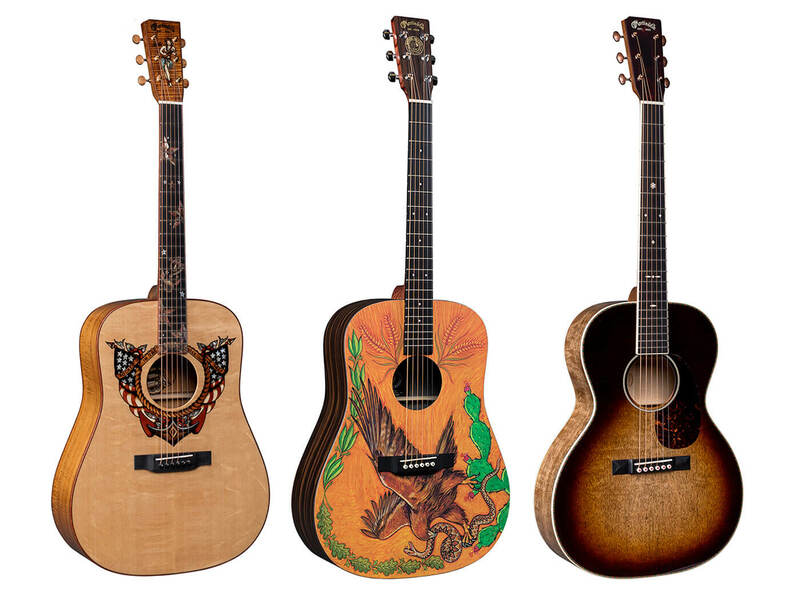 Martin just keeps ’em coming with an eye-catching collection of special and limited edition models. Leading the charge is an exquisite D-Homeward guitar that celebrates a famed American-style tattoo pioneer. Other notable entries include anniversary models, the arresting OMCE blaze burst, and the CEO-9, which features signed labels by Chris Martin IV himself. 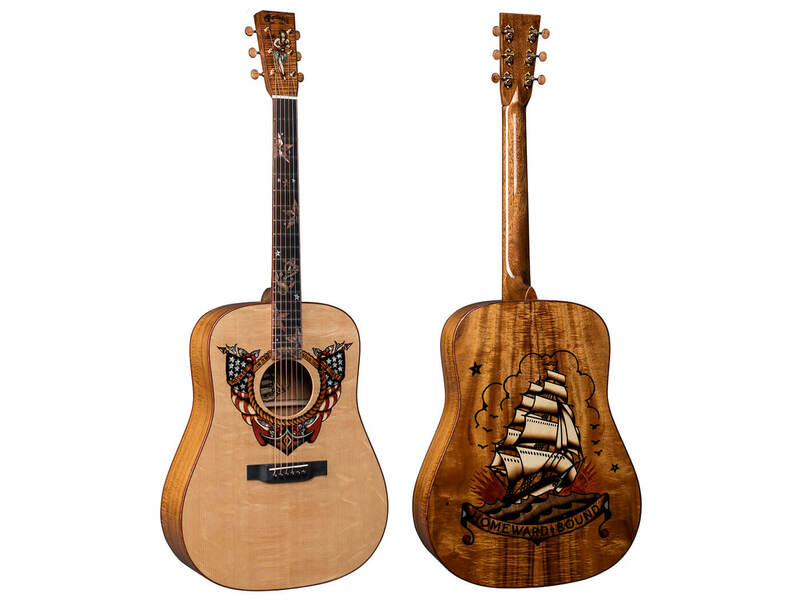 This dreadnought celebrates the famed American-style tattoo pioneer, Norman “Sailor Jerry” Collins. Adorning the guitar are elements of Collins’ work, entitled “Homeward Bound”. You’ll find a special inlay – designed from seashell and hand-picked wood species – that lines the guitar’s head plate, fingerboard and body. And on the back, there’s a beautiful custom artwork of a ship. A combination of pearl and natural wood tones were used to achieve the artwork’s rich, earthy colours. Adding on to these intricate appointments is a stunning tonewood profile. The D-Homeward features a Sitka spruce top with a Heavy Bearclaw design, Koa back and sides, and a classy quilted Bubinga binding. Wrapping up its look is a gorgeous custom inlaid Koa headplate. This HPL dreadnought commemorates the 30th anniversary of Martin’s manufacturing plant in Navojoa, in the Mexican state of Sonora. It’s designed with elements that pay tribute to Martin’s Mexico-based team, who’ve had a hand in producing affordable, high-quality instruments. As a hat tip to these employees, the guitar boasts custom artwork by Robert F. Goetzl that incorporates Mexican national symbols. Its tonewood appointments include Macassar-patterned HPL back and sides, a laminated birch neck, as well as an FSC-certified Richlite fingerboard and bridge. The OMCE Shadow Burst is the outcome of Martin workers’ fascination with some arresting finishes in various solid body and electric guitars. As far as finishes go, this orchestra-style instrument is a product of Martin’s successful experimentation with different finishing techniques. It boasts a stunning translucent black sunburst finish augmented by an abalone rosette and a multi-stripe border at the top. This classy veneer is complemented by a unique tonewood profile that consists of a Sitka spruce top, quilted maple back and sides, and a shiny silver binding. Rounding out the model’s features is a high-performance taper neck that enhances playability. Limited to 50 instruments. Retails at $3,999. This custom 42-style dreadnought is another addition to the limited-edition catalogue. It’s built from top-of-the-line tonewoods, including a Carpathian spruce top with aging toner, as well as East Indian rosewood back and sides. The guitar also comes with an European flamed maple binding – with multi-stripe border – that wraps around its body, fingerboard, and headplate. This sophisticated tonewood combination is complemented by a beautiful abalone rosette with multi-stripe border, and an abalone fingerboard inlay. Wrapping up the guitar’s look is a forward-shifted X-bracing and nickel open-gear tuners. Limited to 50 instruments. Retails at $9,999. You’ll be hard-pressed to find a guitar as resplendent as this 00 14-fret, slope-shoulder model. It strikes a bold pose with a gloss mango sunset burst finish that’s paired with figured curly mango back and sides. Other design appointments include an antique white binding and a heelcap with a multi-stripe border. In terms of tonewoods, this guitar features an ebony fingerboard – with a neat Style 42 snowflake inlay – and an ebony bridge. This dark, regal appeal is well-complemented by vintage copper open-gear tuners and a stylised script logo atop a faux tortoise headplate. And as is customary with CEO models, the CEO-9 will include a signed label – by Chris Martin IV himself – and will be numbered in sequence. Joining the spread of special and limited-edition models are two stunning guitars: the CF Martin D-45 Excalibur and the Size 1 De Goni Authentic 1843. Though official images of both guitars have not been released, their features are definitely worth a peek. As its name suggests, the CF Martin D-45 Excalibur is inspired by Arthurian legend. This guitar features original artwork of a mythical dragon on its body, a custom inlay of a dragon intertwined around a custom rosette, and a custom back purfling. It’s available in a highly limited run of 20 models, and retails at a staggering $39,999. The Size 1 De Goni Authentic 1843, on the other hand, nods to Martin’s storied heritage. This guitar celebrates the brand’s very first Size 1 model, which is noted as the earliest X-braced guitar ever documented. Though it isn’t priced as steeply as the Excalibur, this guitar will still set you back by $12,999.